Obituary – Dent, Joseph Amarbe « Perry High School Alumni Association, Inc.
Football 53-54, Band 53-56, All School Revue 55-56. Joseph “Joe” Amarbe Dent passed from this earth on September 25, 2017 at the age of 79 at his home in Red Rock, Oklahoma surrounded by family. Joe was born December 12, 1937 the eldest child of Abraham Dent, Sr. and Wilma Dailey Dent. He was the grandson of the last hereditary Otoe-Missouria Chief Ralph Dent and Madge Pettit Dent. He was the great grandson of Chiel Hoke Dent (Chief Blue Hair) and Chief Dave Petit (Chief Wach’ehi Manyi). He was a descendent of Chief Big Soldier, Chief Harragarra and the great Chief Letan (Chief Sumanyikathi). Joe was raised at the Dent family allotment between Red Rock and Perry, OK with his nine brothers and sisters. As a descendant of chiefs, Joe was taught the traditions and ways of the tribe as a child. Joe graduated from Perry High School in 1956. He was a U.S. Air Force veteran and was stationed in the South Pacific in the years following the Korean War. 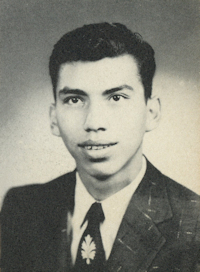 In 1959, he married his wife, Rita Jiron (Taos Pueblo) in New Mexico and moved back to Oklahoma. He became certified in automobile paint & body repair through Okmulgee Technical School and worked in that industry until he could no longer continue his career due to health concerns. Joe then became certified in phlebotomy and worked a number of years at the Oklahoma City Indian Clinic before retiring to Red Rock. After moving to Red Rock, Joe served as a member of the Otoe-Missouria Tribal Council in the capacity of Second Member. Joe learned the ways of the Native American Church from his grandfather, Jim Pettit. He held the position of Chairman of the Otoe Church for 20 years. He kept his own fireplace until his passing. He and his wife, Rita, were faithful believers regarding all aspects of the church. Joe’s dedicated friendship with many Kiowa elders resulted in becoming a member into the Kiowa Tia-Piah Society. His friendship with the Kiowa people continued until his passing and was sincerely cherished. Joe also established the honor of being recognized by the Ponca NAC Chapter and was very humbled to be accepted into and included in their tribal ceremonial traditions. Throughout his travels, he made friendships and relationships among various tribes and all were very sacred to him. In 2004, Joe was awarded the Oklahoma Spirit Award by Governor Brad Henry. 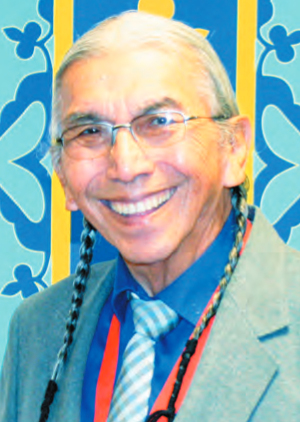 In 2014, he was recognized at the AARP Indian Elder Honors. Joe was preceded in death by his parents, one son: Calvin Wayne “Humphrey” Dent; two daughters: Treva Louise Dent and Sonia Renee Dent, one brother: Ira Hoke Dent; and two sisters: Patricia Dent and Madge Francis Dent. He is survived by his wife Rita; three children: two sons, Ralph Dent of Red Rock, Anthony Dent of Sapulpa; and one daughter, Shanelle Dent of Ponca City; 12 grandchildren and 13 great grandchildren; two brothers: Abraham Dent, Jr. and Dana Dent; five sisters: Rose Lane, Carole Aquero, Rhonda Dent, Etolia Habibi and Joan Aitson. A traditional feast will begin at noon on Thursday at the Otoe-Missouria Cultural Center. Burial will follow at the Otoe-Missouria Cemetery. The pall bearers for the service are Kyle Robedeaux, Aide Robedeaux, Gideon Goodeagle, Robbie White, O.J. Littlecook, Pete Littlecook, Oliver Littlecook, and Jade Roubedaux. Services are in care of Grace Memorial Chapel.